General Release Notes from the October 1st 2016 update. Implemented new ICD-10-CM codes and new GEMs. Click here to read more about the ICD-10-CM updates for Fiscal Year 2017. Implemented the ability to export CCDA's to specialized registries. For more information, click here. Implemented the ability to choose different headers for the patient summary. Implemented a redesigned task list with improved functionality. Implemented the ability to right-click inside of an invoice to quickly perform various functions such as adding, modifying and removing charges and payments. Implemented new buttons on the patient chart to quickly scan, view the summary, print a statement and send a CCDA. 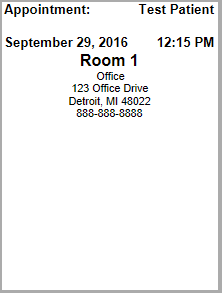 The addition of the practice phone number on appointment labels. 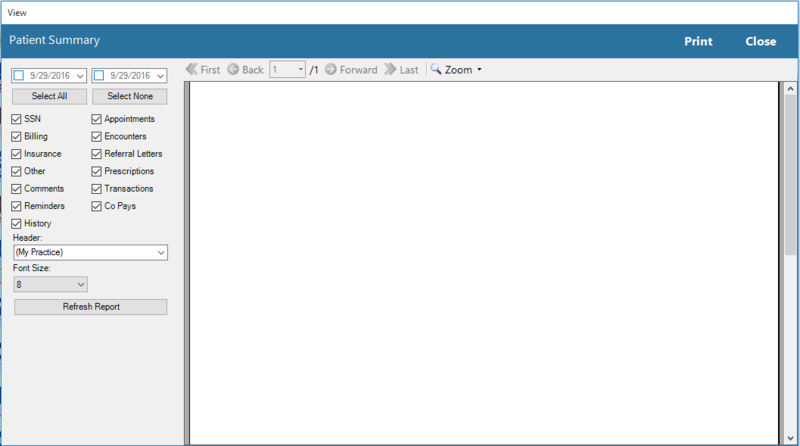 Implemented the ability to resize various columns in TRAKnet and have them remain at their new sizing even after navigating to a different screen or restarting the program. 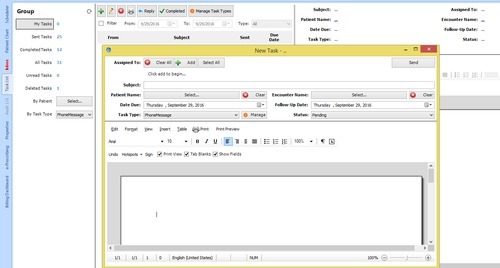 Improved speed in patient ledger and encounter invoices for cloud clients. Implemented a one-time login pop-up advising providers of our terms of service. To read our terms of service, click here. Implemented a link to the TRAKnet Suggestions Forum in the Links menu. Renamed the 'Gateway/Merchant ID' field in TransFirst Merchant Accounts to 'Gateway ID' to reduce confusion. Resolved an issue wherein the SSN link and several links containing phone numbers were not formatted with the appropriate dashes. Resolved an issue wherein when using more than one monitor, certain windows such as encounters would pop up on a separate monitor from TRAKnet. Resolved an issue wherein the User Name dropdown menu would disappear if the logged-in User Name or the Practice Name were too long for both items to display. The Integrated Labs dropdown menu was removed to create more room for the User Name and Practice Name dropdown menus. Resolved an issue wherein the ability to set a patient's legal guardian to 'None' through the LegalRepresentative link was not available. Resolved an issue wherein copying an encounter and then choosing to copy a different encounter would copy each encounter's treatments instead of just the most recently copied treatments. Resolved an issue wherein unchecking the date range on legacy reports would set the From and Through date to 12/31/9998. Resolved an issue wherein embedded treatments in notes were not going into the invoice in the same order as they were embedded. Resolved an issue wherein the Manage Practice Lists option in the User Name dropdown menu did not open the Practice Lists editor. Resolved an issue wherein very large header images from TRAKnet 2.0 encounters were sized too large to fit on the encounter in TRAKnet 3.0. Resolved an issue wherein when choosing to print specific pages from a multiple page document, TRAKnet would instead print every page. Resolved an issue wherein if the patient's latest encounter was deleted, opening the Progress Notes tab in the patient chart would display the deleted encounter's note. Resolved an issue wherein treatment comments for dependents would not appear in the legal representative's ledger. Resolved an issue wherein, under certain circumstances, column widths in the Charges tab of insurance payments would be erroneously resized. Resolved an issue wherein, under certain circumstances, treatments copied from a previous encounter would have diagnosis pointers in an incorrect order. Resolved an issue wherein restarting the TRAKnet program would cause the custom dictionary to erase. Resolved an issue wherein selecting a mini-template or a link in a template or note would not return the cursor to the form. Resolved an issue wherein the PreferredPhone link would not display the patient's phone number unless the patient's demographics were opened and saved first. Resolved an issue wherein the Charges tab in the patient ledger would not display patient or provider paid amounts. Resolved an issue wherein, under certain circumstances, accessing referral letters through the encounter would not associate the correct encounter with the referral. Resolved an issue wherein the Numbers link would default to a blue highlighting even if the field had not been completed. Resolved an issue wherein, under certain circumstances, statement PDF files could not be opened from the patient chart. Resolved an issue wherein secondary claims with a None or Paper out put would not appear under those filters in the Billing Dashboard. Resolved an issue wherein, under certain circumstances, the Past Surgical History and Past Medical History links were altering font formatting in the visit note. Resolved an issue wherein the Age link would not update correctly on copied visit notes. Resolved an issue wherein patients were being sorted by first name in the facility visit details view. Resolved an issue wherein entering a mini-template into a form such as HPI, Past Surgical History, etc. the cursor would be placed before the inserted template. Resolved an issue wherein task types in the new task list could not be updated. Resolved an issue wherein prior patient tasks were not appearing in the Phone Messages tab. 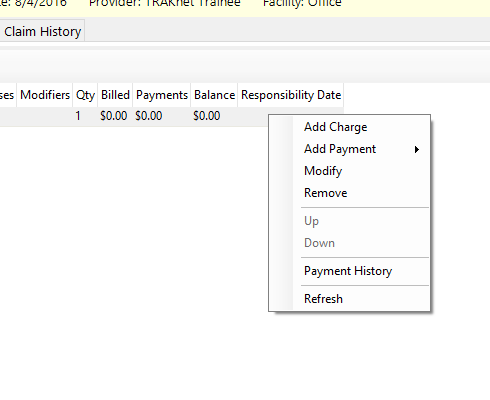 Resolved an issue wherein, under certain circumstances, encounters could not be saved after using Charges Edit Mode in the invoice. Resolved an issue wherein, under certain circumstances, the scheduler tab would display as entirely blank. Resolved an issue wherein, under certain circumstances, batch print superbills would not load past the first patient. Resolved an issue wherein mini-templates inserted into a template could not be opened and edited. Made several changes to the new task list to improve functionality. Notably, all patient tasks can be viewed through the patient group in the task list. Resolved an issue wherein tasks in the Phone Messages tab were displaying out of order. Resolved an issue wherein signatures would duplicate when using copy-visit. Resovled an issue wherein date/time stamps would not display on a printed task. Resolved an issue wherein the SmokingStatus link would display as a numeral. Resolved an issue wherein not all tasks were converted to the new Task List. Resolved an issue wherein users were unable to restore deleted tasks. Implemented the ability to add a comment on a task without replying. Resolved an issue wherein tasks could not be replied to when associated with a patient encounter. Resolved an issue wherein tasks could not be completed by a user that is not assigned to the task. Resolved an issue wherein a task's status could not be seen by a user that is not assigned to the task. Resolved an issue wherein the Date Last Seen checkbox in Claim Details could not be unchecked if the date has been set in the patient's demographics. 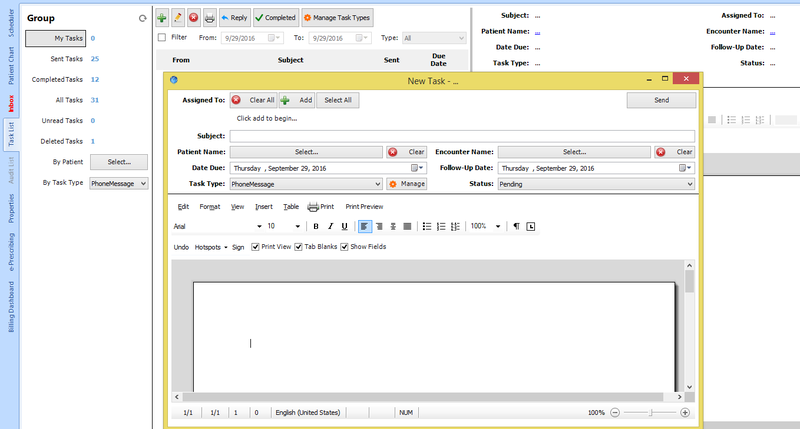 Resolved an issue wherein the Tasks button in an encounter still uses the old task window. Resolved an issue wherein exported CCDA's were not formatted to a standard accepted by the US Wound Care Registry. Resolved an issue wherein deleted tasks could not be restored. Resolved an issue wherein the footer on printed tasks was missing. Resolved an issue wherein tasks could not be commented on by the assigned user. Resolved an issue wherein, under certain circumstances, not all prior tasks had been migrated to the new task list. Resolved an issue wherein, under certain circumstances, treatment comments were being duplicated on the Pending Claims report. Resolved an issue wherein treatment comments containing semicolons displayed incorrectly in the Pending Claims report. Resolved an issue wherein inserting the Today's Date link placed the date into the template and not the actual link. Resolved an issue wherein, under certain circumstances, tasks were being converted from the old format without their associated patients. Resolved an issue wherein, under certain circumstances, the loading icon for patient eligibility on the scheduler would be indefinitely displayed.